Most Org Charts will be too big to show all at once on the page. This tutorial explains how to manage larger org charts. 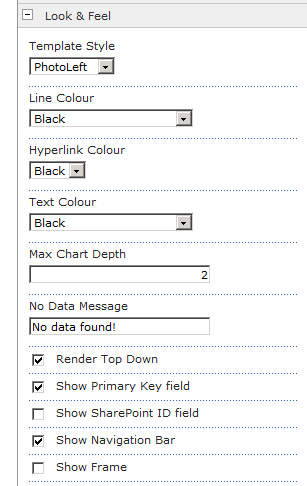 In the SharePointOrgChart web part, open the configuration properties and set the Look & Feel > Max Chart Depth. This controls the number of levels that are shown and may be set as low as 2. The configuration property Look & Feel > Show Depth Buttons allows end users to dynamically show or hide additional levels. Press OK to commit the changes. Your Org Chart will now be displayed, using only the number of levels specified in Max Chart Depth. Use the arrow buttons to navigate up and down the chart.